We have personal return address labels! 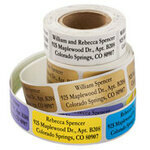 Our personal mailing labels let you address envelopes, fill out applications and rebates, label CD's, books, travel guides. Set of 200 self-stick; 2" x 3/4". Print up to 4 lines, 30 letters/spaces each. We have personal return address labels in script style print! 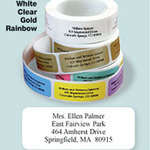 Our personal mailing labels let you address envelopes, fill out applications and rebates, label CD's, books, travel guides. Set of 200 self-stick; 2" x 3/4". Print up to 4 lines, 30 letters/spaces each. We have personal return address labels in block style print! Our personal mailing labels let you address envelopes, fill out applications and rebates, label CD's, books, travel guides. Set of 200 self-stick; 2" x 3/4". Print up to 4 lines, 30 letters/spaces each. Return address labels with an old English initial! Add your address to envelopes, applications, rebates; label CD’s and books. Set of 200 self-stick; 2 x 3/4". Print up to 4 lines, 30 letters and spaces each. 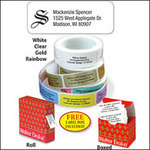 Specify item number and color: white, clear, gold, or rainbow with five colors in a set. 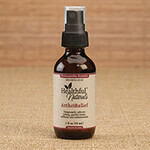 …unique leg contours and reducing pressure on your back, hips and knees. Plush, removable pillowcase is soft against skin. * Firm-density foam in a lightweight design. * Contour leg pillow returns to original shape when not in use. 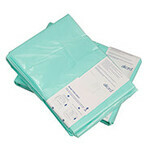 * Machine-washable polyester pillowcase. * 9 1/2”L x 8”W x 5 1/2”H. Return address labels in calligraphy style print! Address envelopes, fill out applications and rebates, label CD's, books, travel guides. Set of 200 self-stick; 2" x 3/4". Print up to 4 lines, 30 letters/spaces each. …Lift out empty refill liner cartridge. 2. Slide new refill liner over cartridge. 3. Remove paper band. Pull OUTER layer of refill liner. 4. Pull refill liner down through the middle of the cartridge. 5. Return cartridge with curved side towards from of pail. 6. Pull refill liner down and tie a knot. CPAP Gel Mask Leak Sealer, 4 oz. Replacement probe fits the Biofeedback Kegel Exerciser, designed to combat incontinence by strengthening the pelvic floor muscles with real-time feedback for improved results. Batteries not included. This item is non-returnable. Regular exercise with the Super Kegel™ exerciser helps strengthen pelvic floor muscles and improve bladder control. 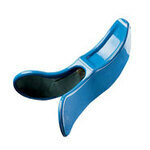 Steel kegel exerciser is covered with padded vinyl. Includes a 9-page booklet and detailed exercise chart. Effective for men and women. This item is non-returnable. Elation waterproof massager features a skin-soft surface and lifelike shape. Choose from 10 settings, easily adjustable with the push of a button. Waterproof wand for safe use anywhere. Requires 2 AA batteries (not included). 6 3/4" L. This item is non-returnable.